Yea, I think there was an Easy Tiger review that made the mistake of calling them Neal Casal's band too. I wonder where on Earth they come up with the idea? I don't know - I always think of Neal as unofficial leader of the other musicians but they are Ryan's band to me. I think where it comes from is that Neal is a solo artist in his own right whilst none of the others are - therefore I think people presume they're his band. I'll try not to get over excited. The moving image I posted is the most interesting part. BEIJING (AFP) - One of the world's hairiest men Yu Zhenhuan, a rock singer who calls himself "King Kong," has launched a campaign to run in next year's Olympic torch relay, Xinhua news agency said Tuesday. 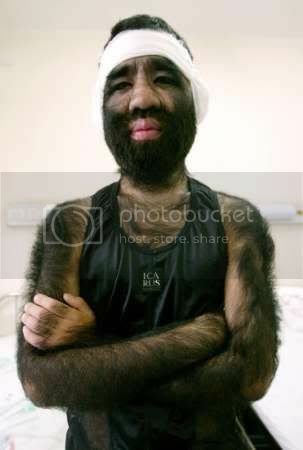 The hirsute Yu, from the northeastern province of Liaoning, says he is a perfect candidate. "The Olympics belong to everyone -- those with abnormalities included," Yu was quoted as saying. "First I am a celebrity, inside and outside of China and secondly, I think my experience in coping with a disfigurement ties in with the notion of Olympic spirit." With hair covering 96 percent of his body, Yu is pipped in the Guiness Book of Records by two Mexican brothers dubbed the world's hairiest with 98 percent coverage. I want to know where the non-hairy 4% is. Oh, I forgot. His lips add another 0.03%. A six-day-old lamb at a veterinary clinic on New Zealand's South Island bleats like any other newborn sheep, but is rather different in other ways. 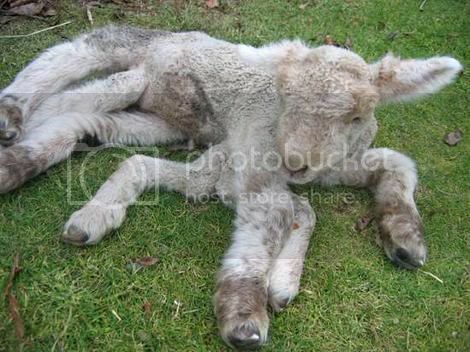 This lamb has seven legs, local media reported today. Two of the extra legs hang uselessly behind the lamb's forelegs. The animal has three hind legs, one of them with two hoofs. It walks using its two forelegs and three hind legs, the Ashburton Guardian newspaper said. The lamb was born last Friday on the farm of Dave and Di Callaghan. Mr Callaghan said he was surprised to find the creature, born with a twin, walking round in the paddock with its mother and normal twin sibling. Veterinarian Steve Williams at the Canterbury Vets clinic in the rural town of Methven said he believed an error during embryo formation had resulted in the lamb being born polydactyl - with many legs - a condition that occurs once in several million sheep. But I don't how C always comes up with the best articles. Hey, when Thomas the Tank Engine news break, you always have the scoop. Darn, you beat me to it again! I was just about to post that story. I had a moving image too! Does your lamb move? No, it does not. It's got 7 legs. It can move like Carl Lewis, dooooooood. No way, doooooood! Wanna talk about it? omgzzz, is that the time?? ?